3 Crown -Garage doors in standard and made to measure sizes, built with an integral steel frame bonded over to provide added strength and rigidity. 4 Crown- Garage doors in standard and made to measure sizes, feature double skin construction with internal steel reinforcing. The flat backing conceals all bracings for a very neat interior finish in light reflecting white. Doors over 10 wide feature external white powder coated steel horizontal stiffeners to the rear of the panel for increased rigidity. Due to the double wall construction of these doors, no translucent window options are available. Canopy door frames are supplied with a 60mm frame on both sides and 60mm head - Tracked doors frames are supplied on a 75mm frame on either side & on the head of the door. This door comes complete with three point locking black handle as standard. Our popular range of brilliant White High Gloss G.R.P. doors is designed to complement any home. With a variety of traditional and exclusive designs made solely to order, each door is hand-built and specified to your requirements. The low maintenance surface hasno unsightly seams, welds or joins to detract from carefully crafted styling. A wide range of options allow you to refine your door choice to enhance your house style. Individual White Gloss styles are available in a choice of three build qualities; 3, 4 or 5 Crown, all fitted with security locking as standard and ready for optional electric operation when order on tracked gear.l Brilliant White Gloss finish l Custom sizes available up to 16'0" (4877mm) wide and 8'0" (2438mm) high The widest range of designs available, Choice of clear or stippled translucent (3 Crown only) or black opaque (3,4 & 5 Crown) window options, 'Wipe-clean' low maintenance surface, Choice of three build qualities and two gear options, All Wessex G.R.P. 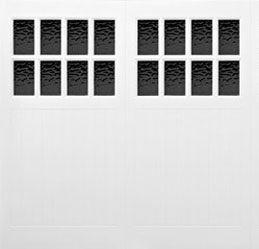 doors are available with an optional primed or fully finished steel or G.R.P. frame. Please see page 23 of the Brochures. Wessex White Gloss G.R.P. doors are supplied with multipoint latching operated by a security lock as standard. The rear panel on all 4 & 5 Crown doors has a flat white finish. G.R.P. doors are suitable for use with remote control electric openers when selected on the correct gear to accept automation.